The study is the first to show that the drug does not require the presence of herpes simplex virus 2 (HSV-2) to suppress HIV in patients. The research shows that the drug probably reduces HIV levels by interfering with HIV’s reproductive machinery. 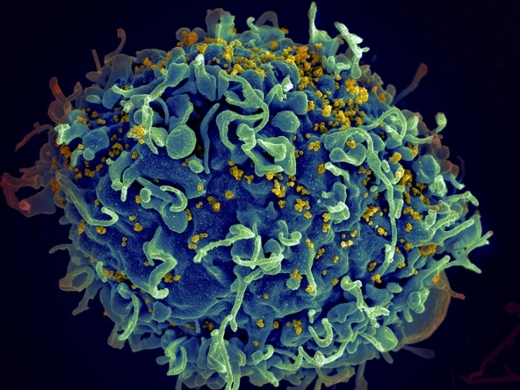 Scanning electron micrograph of HIV particles infecting a human T cell. Source: National Institute of Allergy and Infectious Diseases (NIAID), National Institutes of Health (NIH). The study is published online in Clinical Infectious Diseases. The researchers enrolled 18 HIV-infected persons, none of whom was infected with HSV-2, and treated them for 12 weeks. Half of the subjects took valacyclovir twice a day and the other half received a placebo. After two weeks, the placebo group received valacyclovir and the other group received a placebo. When the subjects took valacyclovir, their blood HIV levels declined significantly. “This study builds on our earlier published work on the impact of acyclovir on HIV-1. Because of the success of this study, the group plans to conduct larger, randomized trials with the hope that valacylovir can eventually be added to the drug cocktail used to treat HIV,” says Raymond F. Schinazi, PhD, DSc, a senior author of the study. Schinazi is Frances Winship Walters Professor of Pediatrics in Emory University School of Medicine; senior research career scientist at the Atlanta Veterans Affairs Medical Center; and a member of the Emory Center for AIDS Research (CFAR). A study by the same research team in 2008 showed that acyclovir suppresses HIV in laboratory cultures of human tissues that were infected with various kinds of herpes viruses. Valacyclovir, which is structurally similar to acyclovir, is converted to acyclovir in the body and remains in the blood longer. The first authors of the paper are Christophe Vanpouille and Andrea Lisco, both with NICHD. Other authors are Leda Bassit, Robert Kauffman, and Raymond F. Schinazi (senior author), Emory University School of Medicine and Veterans Affairs Medical Center in Atlanta; Michael Lederman (senior author) and Benigno Rodriguez of Case Western Reserve University and Case Medical Center and Hospitals; and Jorge Sanchez, of The Civic Association for Health and Education in Lima. The study was supported by Emory’s CFAR as well as the NIH’s Bench to Bedside Program, which funds research teams seeking to translate basic scientific findings into medical practice. For more information see the NIH press release.